Our first morning in Sydney, October 28, 2011, we walked to the Sydney Sustainable Markets @ Taylor Square to see what we could find to fix food in our rental unit for the week. There were some nice vendors out and we sampled many items. We came home with a good selection of fresh, organic foods to help us through the week. I have to say the eggs in Australia don’t have yellow yolks, they’re orange. I wish I would have gotten a picture because here the yolks are usually a pale yellow. When we got over to a section of stands lined up in a row we stopped at the first one and were greeted by Kristina Pardy. She was enthusiastically telling us all about the food as she ate a little container. And then she told us this wasn’t her stand, she was just keeping an eye on it for the owner. This was eco-pasti an assortment of fresh marinated vegetables. We purchased the Zucchini flavoured with thyme, Sweet potato sprinkled with macadamia nuts and Japanese pumpkin brushed with pesto. Right next to the eco-pasti booth was The Pasta People. Again, Kristina was there telling us how wonderful the pasta and sauce were and what a great meal they’d make. 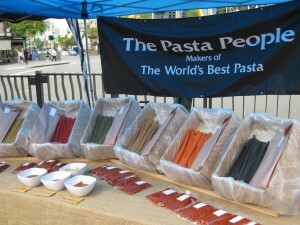 The dried pasta selection was amazing and all looked so wonderful. 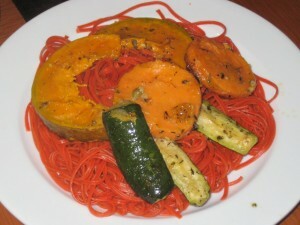 We purchased the Chilli Linguine to go with our vegetable selection. This had a nice spicy kick and I love spicy food. Add a loaf of your favorite bread, also available at the market and you have a meal. And then, next to all the savory foods, was the stand that belonged to Kristina. She’s the talent behind Luv Bites, all kinds of yummy chocolates. She gave us several samples and they were all wonderful; gluten free, dairy free, organic and no processed sugar. There were several flavors of truffles and these most delicious brownies. I’m sorry to say I never thought of taking a picture before I popped them into my mouth. 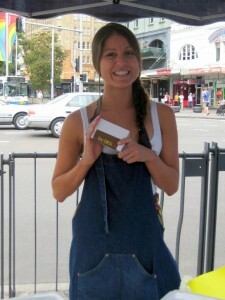 Kristina is a wonderful person and she made our shopping experience at Taylor Square enjoyable. 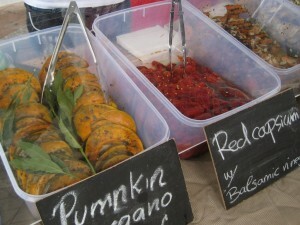 It was great how she helped out her neighboring vendors and sold us on the pasta and eco-pasti. We had a wonderful meal and dessert that was fresh, healthy and all natural from our stop at Taylor Square. It didn’t take us long to cook the pasta and heat the vegetables for our dinner. I wish I had a market like that I could go to here and get the great food. We have markets in the summer but the little row of stands that had everything; pasta, toppings, bread and dessert were perfect. I will have to keep hunting around town when the weather warms and see what I can find.